Your acne is telling you something… are you ready to listen? Your body speaks to you in symptoms, and acne is a symptom of a deeper problem. Your acne is not telling you to buy a pricey facial serum or heavy-duty concealer. Your acne is telling you to change your diet. Who needs to read Quit Acne? Lauren is a fantastic synthesizer of information! She sifts through the sea of information, pulling forth the gold nuggets. This "no fluff" book clearly explains the underlying causes of acne - estrogen dominance, liver congestion, and fatty acid imbalance. Covered topics include: the science of fat, a sensible approach to dairy, foods to avoid, and how to restore balance with specific foods and supplements. Very well referenced for those who desire a deeper investigation. I have been researching nutrition for a few years now and was surprised how much I learned from the little gem! My teenage son's cystic acne has, dare I say, come to a halt. He (we) adopted this protocol 100% and he is now seeing the results - he's thrilled. The one food that wreaks havoc on hormones and exacerbates acne. The connection between dairy intake and acne. How balanced blood sugar affects the clarity of your skin. Through acne, your body has been asking you to change your diet. It’s finally time to listen. It's really great to see a book about acne that actually addresses the REAL causes of acne. And one that also addresses healing acne from a nutritional approach. I love Lauren's book QUIT PMS, and this one follows suit by providing well researched information and easy to implement solutions. 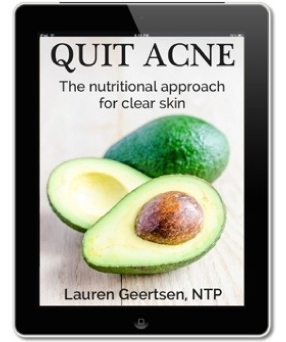 This book was amazingly straightforward and realistic in it's approach to taking feasible steps to eliminate the factors that attribute to acne. I've struggled with acne for many years, and I look forward to implementing the suggestions in this book! 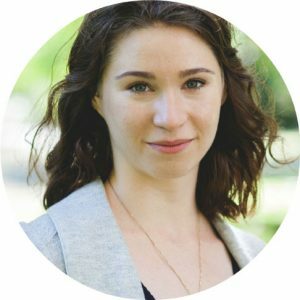 I’m Lauren, a Nutritional Therapy Practitioner and the founder of Empowered Sustenance. I’m on a mission to empower others with the steps that freed my life of chronic pain and medications. When doctors told me that surgery and medication were the only answers to my debilitating autoimmune disease, I decided to find different answers and experienced first-hand the healing power of food. In the same way, I took matters into my own hands when it came to my severe acne. When expensive skincare and facial treatments failed me, I turned to nutrition to successfully clear my skin. Is QUIT ACNE available as a paperback? Currently, the book is only available as a Kindle digital book. Can I read QUIT ACNE without a Kindle device? Yes, you can read it on your computer/phone/tablet using the free Kindle Reader App here. Is QUIT ACNE suitable for vegetarian, vegan or restricted diets? The hormone-balancing protocol is adaptable for a vegetarian diet and restricted diets, but not a vegan diet.